Two teams of Harker students performed admirably at this past weekend’s Middle School Science Bowl regional competition. 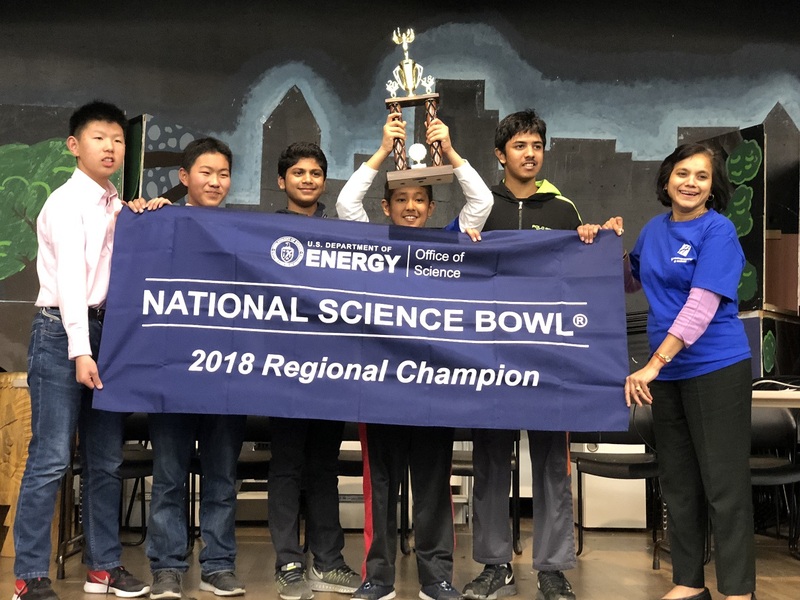 The first team, consisting of eighth graders David Dai, Harsh Deep, Shounak Ghosh, Rishab Parthasarathy and William Zhao, went undefeated throughout the competition and emerged as the winner, earning a trip to Washington, D.C., for the national finals. Team two, made up of seventh graders Rohan Bhowmik and Brian Chen, and eighth graders Mark Hu, Kailash Ranganathan and Aditya Tagore, advanced to the double elimination round after going 5-0 in the round robin portion of the event. Both teams were coached by upper school students Leon Lu, Kaushik Shivakumar and Alexander Young, all grade 11; and sophomores Emily Liu and Kyle Li, all of whom participated in the Science Bowl as middle school students. With this victory and the upper school team’s previous regional win, Harker will send two teams to the Science Bowl national finals for the first time in Harker history!